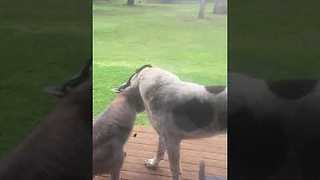 Rumble / Funny & Cute Animals - Who says that cats and dogs can&apos;t be friends? These two are here to prove all those people wrong! Apparently, cats and dogs can be the best of friends! 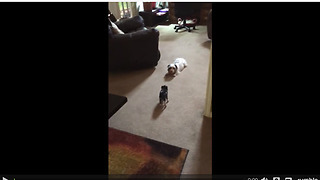 Just like these two in the video. A precious canine friend is relaxing on a bed, and his best friend is keeping him company! Cuteness overload! However, the amazing feline is not letting him sleep and relax as she keeps on cuddling to which her adorable canine friend responds with wet kisses. He&apos;s probably happy knowing his best friend, the cat, is happy. That&apos;s what friendship is all about, right? Maisy is a rescued five-year-old American bully/pit bull and Motor is a six-year-old cat. He fell in love with her from day one, whereas she had never seen a cat and would fixate on them with a laser beam stare. But after a couple months together, this is the outcome. They cuddle all the time, groom each other constantly and he seeks her company all the time! How cute! Watch the adorable moment when one overly-affectionate cat cuddles with her canine best friend and engages in a long, friendly hug! It is hilarious how the kitty keeps on snuggling with the dog while keeping them eyes shut, for maximum pleasure! What a special bond these two share. Amazing! 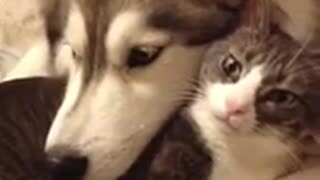 Footage shows a cat and a dog who are definitely best friends and share a special bond. 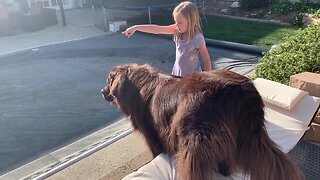 Watch how the needy cat acts like a tick and won’t stop cuddling with the dog, to which the four-legged pet responds with long, wet kisses on kitty’s head. 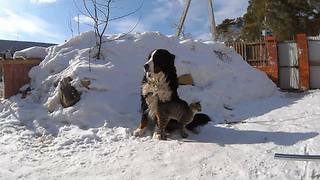 The canine has them paws wrapped around cat’s fur, hugging his best friend from behind! What a loving bond these two share, it is simply incredible! These interspecies friendships is what we love most about our job here. Watching endless hours of videos with all sorts of different animals cuddling and playing in harmony warms our hearts and makes us wish we had such pets around. Seeing how even sworn natural enemies can learn to love and respect each other really makes you put a finger to your forehead and think some things through. If you were ever fortunate to witness the friendship between two animals of different species, you should consider yourself lucky. Those relationships prove that anything is possible if you are taught that there are no differences among us. Cats and dogs are different, but surprisingly they can be real friends! When raised together, they do all the things best friends do. They spend time together and take care of each other. And after a long day of following each other around cats and dogs know how to relax and cuddle together! These two adorable furry pals prove that cats and dogs can sure become besties! 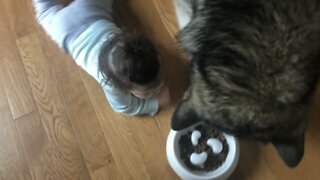 If you too want to bring two different animals together, the best way to do this is to pair them at a very young age. Just like human babies, this is when they develop their cognitive skills as well as their communication skills, so when they learn that this other animal is a friend, they will accept it as such! Ladies and gentleman, today we have the honor of showing you our favorite kind of friendship. Drop everything you&apos;re doing, because you&apos;ll definitely want to check this out. 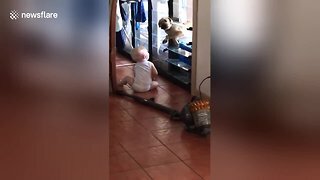 It&apos;s so precious and hilarious, and it will definitely melt your heart. We think you can already guess what we’re talking about. It&apos;s the pure friendship between a dog and a cat! Even though most say that cats and dogs can&apos;t be friends, we strongly disagree. They have the cutest friendships, and this video here is the best proof of that. Just look at them! Awww, they are too cute for words! The precious canine friend is sitting still, and the adorable feline friend is right next to him, giving him kisses. What a beautiful sight! And then someone says that cats and dogs cannot be friends. What a lie! They can, and they are simply too adorable! So precious!